Adventures in the Alaskan Wilderness As a summer counselor with the nonprofit Camp Fire Alaska, Chase Wonderlic '18 got in touch with his inner child and his adventurous spirit. 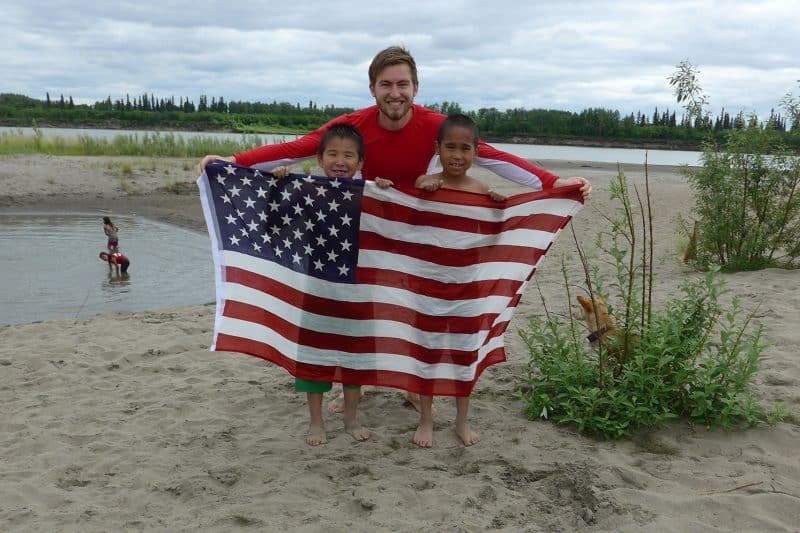 Chase Wonderlic ’18 poses with children in Alaska, where he worked as a camp counselor over the summer. Tell us about your summer adventure. This summer, I was part of the rural staff for a nonprofit called Camp Fire Alaska. After being trained in Anchorage to work with young kids and run the agency’s version of summer camp, I traveled to remote parts of Alaska where the camp was actually set to take place. The remoteness I’m talking about is staggering to think about. There are few roads in Alaska to begin with, and many native Eskimo villages are located hundreds of miles away from them with only tundra and mountains in between. Every two weeks, my work partner and I would pack up our supplies and belongings, only to hop on a tiny plane and set up shop all over again in another village. 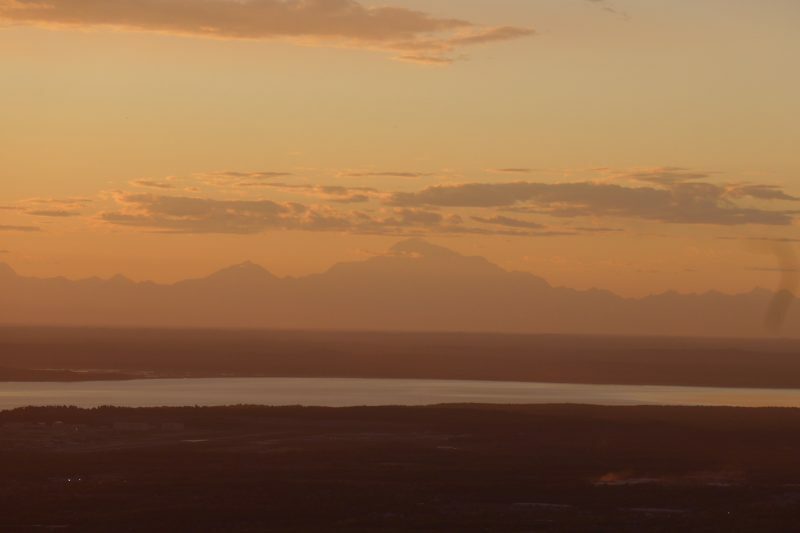 During my eight-week contract, I went from Kodiak Island to the Yukon-Kuskokwim Delta and on to the Wrangell Mountains. I suppose I was sort of like a touring circus, bringing arts, crafts, games, skits and food to children living in the middle of nowhere. Camp Fire has been running this program every summer for more than 50 years and has expanded its reach to nearly 30 communities. The size and scope of their operation comes with personnel and resources that prove helpful for a person like me, who knew very little about the state of Alaska and the indigenous people that maintain a subsistence lifestyle of hunting, fishing and foraging. There was so much to learn: Yupik language, Alaskan geography, salmon fishing, the history of dog mushing, the list goes on and on. And there was so much to try: fermented seal oil, bowhead whale blubber, salmonberry ice cream. Every morning, my work partner and I would plan out our daily schedule, loading the seven-hour camp with all kinds of activities and projects. Some of the day was meant to be more serious with curriculum that taught health, fitness, anger/stress management and outdoor appreciation. Other parts of the day were reserved for all sorts of games, some of which we invented or innovated on as the summer went. In the evenings, I would hang out with the elders of the village, who might be fishing at the beach, picking berries on the tundra, or offroading in their four-wheelers. This community engagement yielded many important relationships which in turn helped my camp gain attendance and support from the town. Although most days had the same bells and whistles, I should stress the adventurous quality that ran through all of it. Maybe there was a brown bear sighted in town. Maybe there was a massive run of king salmon and every family was off in their boat, nowhere to be found. Maybe the weather was so nice that we went swimming all day long. Maybe I burned the food I was using for my healthy eating demonstration. For so much of the summer, I was flying by the seat of my pants, equal parts planning and improvising. And yet I did get better at pulling it off. Who did you meet anyone during the experience who became a mentor or an inspiration to you? My coworkers — the fellow camp counselors — were from many different occupational backgrounds. Some were high school social workers who used their summers off to continue their work in new locations. Others were seasonal workers who had decades of experience working at camps and nonprofits, sometimes living on the road between jobs. Before this summer, I had never been exposed to adults with this kind of lifestyle. My parents had stable jobs year-round, and my home remained in pretty much the same place. Meeting folks who basically improvised their living gave me a new idea of freedom. They were minimalists in material terms, but they were certainly not hobos. I think I identified with the spirit of “flying by the seat of your pants,” and I might want to take some time to live that life, too. There is, after all, a lot to see. My best friend from the summer told me he just wanted to take his talents on a tour of the world. For me, the hardest part of working with children was modifying the way I speak. Blame it on college or David Foster Wallace, but I have a tendency to use opaque words to garble together my thoughts — this itself is evidence enough. But the kiddos just won’t listen to you if you aren’t talking their language. So eventually, I began to articulate myself in the simplest possible terms. This was a good exercise for me as an intellectual, because I had to answer questions truthfully and without complicating matters. For example, if a camper asked me why he should wear sunscreen while hiking I would respond by telling him that the sun won’t reach him if there is something in the middle. It’s not like I have to know the chemistry of sunscreen or the efficacy of it in the long term. I just had to tell him something that seemed honest and final. One day, I think I will apply this technique to teach my own children all sorts of things. What was the most fulfilling part of it? I have never been happier than I was in Alaska this summer. I found out how much room I had to grow ethically. In my lifetime so far, I can tell that my actions and words are not always weighed and considered for their ethical content. At the turn of my junior year, I could tell that professional ambition and academic pride were turning me into a selfish person, little by little. I wanted to be regarded and understood as somebody talented and, for lack of a better word, special. I think this might be the default mode for many young people yearning for success. However, a summer working with children made me drop the act. I still wanted to do a good job, but my goal was to do right by the people I was working for. There wasn’t so much pride in my mind as a passion to serve communities with all I got. The satisfaction did come, but it came from seeing smiles and hearing laughter, from creating happiness in others. What is more, working with children made me focus on staying patient and keeping my mood in control. I also found out how much joyful enthusiasm I had bottled up deep down. I felt humbled when I began to consider my own childhood as a critically important part of my life story. In turn, I took my job all the more seriously, because I was given the chance to participate in the childhoods of others. Alaska is such a unique American treasure. By looking at a map of Alaska for long enough, you can see so many peculiar signposts from history: the first points of Russian contact, the exploration of oil and gas, the mobilization of indigenous people, the historic beginnings of the Iditarod Trail. However, the coolest part about Alaska is the fact that you can actually find a polar bear in the wild. Those massive white bears really do exist. And people find them in the snowy tundra eating seals. How wild is that? I was never a camper growing up, but I have done a good deal with the Outing Club that seems related. Camping in the back country is a good time to break from social life and imagine what kind of person you have been and who you might want to be. Similarly, spending a summer in Alaska gave me time to plan the next steps I wanted to take, so that I could have a real winner of a senior year. I suppose that summer camp as an institution is extremely conducive to this business of “becoming better.” The silliness of the skits and the creativity of the crafts keep you inventing and reinventing yourself. It should also be mentioned that this “last frontier” of the American West is known for instilling in people a tremendous sense of being capable of creating a life for themselves. I certainly felt this spirit in me. The Peace Corps in Uganda is where I’m aiming. The job entails agribusiness consulting and community organizing. It sure sounds like a fitting sequel to my nonprofit work in bush Alaska. Fingers crossed!